As corporates insist on lower emissions and their employees take an increasing interest in eco-friendly company car options, low-emission automotive development is high on the agenda at Volkswagen, as Elena Delgado Vicente, head of fleet, rent-a-car and used car sales Europe, explains. Can you discuss some of the key developments within Volkswagen over the last few months? Elena Delgado Vicente: Volkswagen has made many developments in the last year. For instance, with our new modular toolkit systems and platforms, MQB, we are able to adopt efficient technologies for all vehicle classes in our portfolio. The MQB helps to make the car lighter, optimise production and make it more flexible by creating the potential to allow diverse models to be manufactured at the same plant, resulting in further cost savings. This means that we can bring our electric solution to other Volkswagen models, including our brand new electric Volkswagen, the e-up! To complement our e-mobility solutions, we also offer several additional services, including our Wallbox, which allows batteries to be charged even faster than is possible at an ordinary household outlet, our fast-charging combined charging system, extended mobility solutions for longer distances, emission-free energy deals and full-service leasing offers in Europe. Which VW models are particularly attractive to the fleet manager at the moment and why? The Golf and Golf Variant are exceptionally high-demand models for fleets due to their performance and state-of-the-art technology. As a result, the new Golf generation has again achieved the top position in corporate car sales, complementing the Passat, which is already one of the best solutions for these companies. All of these models not only score highly in quality and comfort, low fuel consumption and emissions, but they also offer excellent drive properties, safety features and running costs. Beyond that, the Tiguan, Touran and Sharan perfectly fit our users, due to good residual values and TCO. 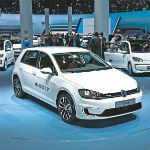 In 2014, the new Golf Sportsvan and Passat will be entering the market. How do you see corporate car fleets evolving? We see a clear trend towards professionalisation in procurement by corporate customers, who are becoming more demanding in all aspects of the company car life cycle, from financing to new mobility services. This is why we have worked intensively on an all-embracing approach to mobility in the future. Starting with highly efficient diesel and petrol engines, and stretching all the way to e-mobility, we are the only manufacturer with such a widespread spectrum. We are able to adopt these technologies for all vehicle classes in our portfolio using the MQB system. What prompted Volkswagen to develop the Think Blue. concept and what has been its success rate? If you want to achieve something, you have to see the bigger picture. Ecological sustainability at Volkswagen is a major corporate objective. That is why we have created Think Blue., which is comprised of three areas: blue mobility, blue behaviour and blue projects. Think Blue. is a holistic approach that not only demonstrates the international sustainability strategy of Volkswagen, but also involves the development of mobility in the future. For instance, we intend to make production at our factories 25% more eco-friendly by 2018, while the energy and water consumption per vehicle has already been reduced by around 10% in the last two years. During the same period, the average CO2 emissions produced by our European new-vehicle fleet fell from 144 to 134g per kilometre. All in all, Volkswagen Group offers 320 models emitting less than 120g of CO2 per kilometre, which is a big financial advantage for markets with a CO2-related tax. To confirm that we are heading in the right direction with this, for the first time Volkswagen has been listed as the most sustainable automaker in the world's leading sustainability ranking. RobecoSAM classed our company as the industry group leader in the automobiles and components sector in this year's review of the Dow Jones Sustainability Indices, which analyse corporate economic, environmental and social sustainability performance. How can fleet managers encourage Think Blue. behaviour among their employees? Ecological and fuel-saving training is already offered by Volkswagen worldwide and can be easily adopted by corporate customers. Mandatory company guidelines regarding CO2 emissions and a bonus system for the implementation of these targets would also help to choose environmentally friendly models. For example, the consumption of each employee could be tracked and, for employees with the most savings, you could assign a petrol-saving award. Could you tell us about the special Think Blue. projects you have been involved with globally? As part of Think Blue., we have established 350 projects in 35 countries. They all show how much fun it can be to live a little bit more eco-consciously. We have a great example in Spain, where we motivate fleet customers to be completely CO2 neutral. The objective is to compensate the first 1,400-2,300km driven, depending on the car model, by planting one tree. Depending on the model, eight to 15 trees will be planted. Each tree will be able to absorb 300kg of CO2 in the first 30 years. So far, there are three Think Blue. forests, in which Volkswagen has planted more than 393,182 trees, already compensating for more than 117 million kilograms of CO2. Can you give us an overview of the technologies and Volkswagen models behind blue mobility? We believe that the question of tomorrow's mobility has many answers. That is why we are increasing the efficiency of our conventional drive systems with the same determination that we apply to projects like the e-up! and the e-Golf. Volkswagen BlueMotion technology features a start-stop system that reduces consumption, and our TDI engines are particularly long-lasting and fuel-efficient. For instance, in the Golf TDI BlueMotion, we reduced consumption by 15% from the predecessor model. The natural gas drive even emits around 80% less carbon monoxide and 60% less nitric oxide while CO2 emissions are reduced by around 25%. In our hybrid engines, the kinetic energy of the combustion engine is stored in a battery and drives the electric motor, producing no carbon emissions on short journeys. Our brand new e-up! is the perfect solution for daily use in the city. The 11.7kW/h per 100km consumption makes it one of the most efficient cars of its kind, even among electric cars. How do you see e-Mobility evolving in the future? We believe that e-cars have great market potential. The demand for oil is growing and supplies will eventually run out, while CO2 is produced in large part by increasing traffic worldwide. In contrast, electricity from renewable sources is inexhaustible and electric mobility is an important part of the solution. Our CEO, Martin Winterkorn, setting out the VW Group's vision has said: "We are starting at exactly the right time. We are electrifying all vehicle classes and, therefore, have everything we need to make the Volkswagen Group the top automaker in all respects, including electric mobility, by 2018." So, all together it doesn't matter how you want to stay efficient in the future - you will do it well in a Volkswagen. 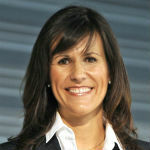 Elena Delgado Vicente, Volkswagen's head of fleet, rent-a-car and used car sales Europe. The e-Golf from Volkswagen features an innovative electric motor powered by lithium-ion batteries.